Did you write letters to Santa Claus and mail them to the north pole when you were a kid? I remember explaining that I had been good (other than the occasional fight with my brother), and detailing exactly what I wanted for Christmas that year. And the amazing part was that I always got a response back from Santa in the mail. I never really questioned it before, but who actually takes the time to write out all those responses? 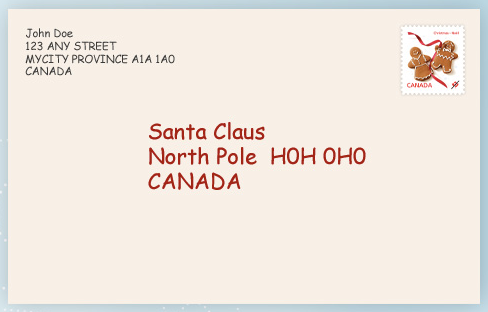 Turns out it's the Canadian postal service it's obviously Santa himself. "While the picture above shows a stamp, letters to Santa do not require postage (Santa would NEVER refuse a letter because it didn't have a stamp on it) and the response from Santa is also delivered for free. We're honoured to help Santa respond to his mail and proud to help teach children valuable literacy skills." Isn't that sweet?! Oh how I love Canada! In out little ontario town the elves (postal employees) pick up the letters from the children at the santa claus parade which is also very very sweet. Im so happy for this post - Sean full out did not believe me that this existed. Poor deprived American children!